As part of the CRTC’s new ‘wireless code’ the carriers are mandated to adopt a 2-year wireless contract option. So far we’ve seen Bell, TELUS, Rogers and Fido come to the table with the necessary changes, plus they’ve already adjusted the monthly rate plans and hardware subsidy pricing. 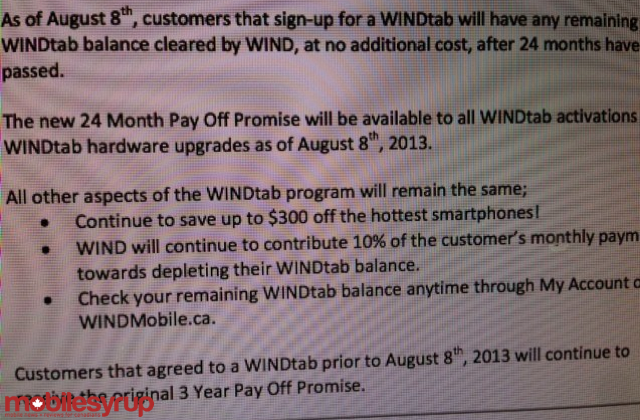 We’ve now received WIND Mobile’s slight adjustment to their WINDTab option. Look for the “24 Month Pay Off Promise” to go live tomorrow.